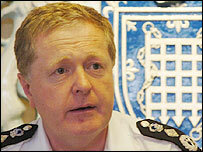 Metropolitan Police chief Sir Ian Blair has accused the media of "institutional racism" in its reporting of murders. The head of London's police said murders in minority communities appeared "not to interest the mainstream media". He highlighted the difference in coverage of the recent murders of white lawyer Tom ap Rhys Pryce and Asian builders' merchant Balbir Matharu. He was speaking at the Metropolitan Police Authority's monthly meeting. He had been asked if the capital's police gave a "proportional response" to all murders. "I am pretty furious. We do devote the same level of resources to murders in relation to their difficulty," he said. "What the difference is, is how these are reported. I actually believe that the media is guilty of institutional racism in the way they report deaths. "That death of the young lawyer was terrible, but an Asian man was dragged to his death, a woman was chopped up in Lewisham, a chap shot in the head in a Trident murder - they got a paragraph on page 97. "With one or two exceptions, clearly Damilola Taylor was one, the reporting of murder in minority communities appears not to interest the mainstream media," Sir Ian said. He said the capital's police had to respond to media interest. He said that while the murders of two schoolgirls in Soham in 2002 were "dreadful crimes" but he had been surprised at how much coverage the murders received. "Let's be absolutely straight. It was a dreadful crime, nobody is suggesting anything else. "But there are other dreadful crimes which do not become the greatest story in Britain and that did for that August period." Is the media institutionally racist?